What could be better on a cold Valentine’s Day than to sit down with a book chock full of stories about special cowboys and their ladies? 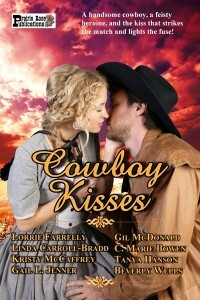 Cowboy Kisses has just what you’re looking for. Eight stories by some fabulous authors who share with you their love stories of the old west. In Lorrie Farrelly’s tale of love and fate, a tattered old diary sends a young woman into the arms of a long-ago Texas Ranger for "A Kiss in Time." Linda Carroll-Bradd’s "When My Heart Knew" is the story of young Maisie Treadwell, who has never been in love before, and handsome Dylan MacInnes, who might or might not be the one. "A Westward Adventure" by Kristy McCaffrey is a story of aspiring novelist Amelia Mercer, who travels to Colorado, determined to find her own adventure to write about. When Bounty hunter Ned Waymire comes to her aid, the true adventure begins. "Valentine Angel" by Gail L. Jenner is a poignant story of a determined young woman who rescues a wounded lawman and then must help him fight off his nemesis. In Gil McDonald’s story, "Hearts and Red Ribbons," a feisty young woman who dresses in men’s clothes and a drifter looking for—something—are thrown together by Fate on a wet February day. "Hunter’s Gamble," by C. Marie Bowen, is a gripping tale of lost love and determination. Life is a gamble, and Hunter knows he can't always win. With true love in the mix, the odds are stacked in Hunter’s favor. "Her Thief of Hearts" by Tanya Hanson is the tale of an outlaw, an orphan, and a socialite—is this a recipe for disaster or true love? Beverly Wells will steal your heart in her story, "Hopes and Dreams." A woman on the run, a sheriff sworn to uphold the law, and one little girl’s pleas to Mr. Cupid for a new daddy. Settle in for some mighty fine Valentine’s Day reading from your favorite western romance authors.